Do You Suffer With Asthma Symptoms? 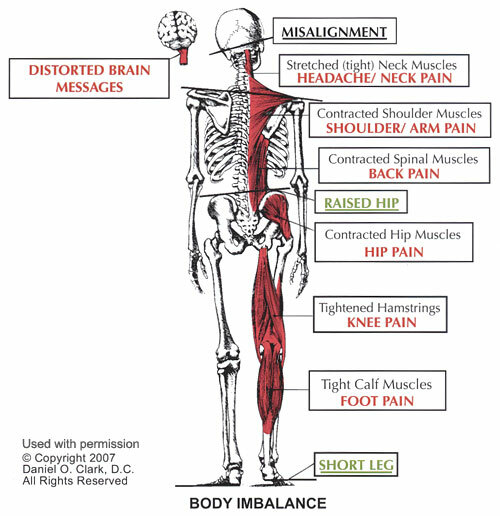 The Common Denominator May Be Head and Neck Misalignment. While the exact cause of asthma is still unknown, many researchers believe that asthma is caused by a disturbance of the respiratory center within the brain stem. In fact, one study suggests this is the “common denominator” and basic underlying mechanism in all varieties of asthma. This disturbance is believed to cause the muscles of the airway to contract thus restricting the flow of air in the lungs. Is There A Relationship With The Head, Neck, and Nervous System? Studies and clinical trials have shown that Breathing problems can develop as a result of a previous injury to the head and/or neck. The typical medical treatment for asthma is prescription drugs which are attempting to cover up the symptoms of asthma. If you have seen the TV drug ads or if you have ever read the Physician's Desk Reference then you know that all drugs are dangerous and long term drug use will almost always result in the development of even more health problems. Virtually all treatments focus on covering up your symptoms. It is important to understand the relationship of the head and neck and how this can affect the function of the nervous system. First of all the brain stem acts like a switch board operator between the brain and the body with literally hundreds of thousands of nerve fibers signaling back and forth between the brain and the body. Chronic inflammation, pressure, torsion, or compression of the brain stem can irritate, or interfere with the transmission of nerve signals from the brain to the body. It is also important to understand the close proximity of the breathing centers in the brain stem to the upper neck. Accident's and Injuries Can Result In Head and Neck Misalignment! An imbalance of the head on the upper cervical spine not only puts pressure on the nerves that go through the upper neck, it can also cause compensatory spinal misalignment in the lower spine. Let's think back for a moment. The nervous system is a very complex system designed to control and coordinate all of the body’s vital functions. One of those functions is to control the respiratory system and lungs. Consider that you can go up a flight of stairs, run, swim, or ride a bike without even thinking about your breathing. That’s because the respiratory center, housed in the brain stem, is responsible for adjusting the rate of breathing to the demands of the body so that proper oxygen and carbon dioxide levels remain unchanged even during strenuous exercise. Asthma involves both the lungs and the immune system and has become a common and costly illness in the United States. An estimated 17 million Americans suffer from asthma at an annual cost of over $13 billion. Asthma accounts for more hospitalizations than any other childhood disease and more than 10 million missed school days each year. Asthma is one of the few diseases with an increasing death rate and causes close to 5,000 deaths annually in the United States alone. Even though asthma is a common condition, it is far from simple. During an asthma attack, the airways become narrow and obstructed due to a combination of muscle spasm, inflammation, and excess mucus production. The symptoms, which vary among sufferers, can include wheezing, shortness of breath, chest tightness and chronic (regular) coughing. Asthma attacks are triggered by any condition that causes inflammation in the airways. Those triggers can be very different among asthma sufferers but usually include irritants like the following: dust mites, animal dander, pollen, mold, pollution, smoke, exercise, cold air, or intense emotions. Misalignment of the top two vertebrae (bones) in the cervical spine (neck) can cause disturbances within the brain stem and respiratory center. Multiple studies have shown that upper cervical care can dramatically improve lung function. A published report documents that each asthma patient in the study improved between 87 and 100 percent with upper cervical care. 1. Amalu W, Chiropractic Management of 47 Asthma Cases, Today's Chiropractic, 2000 Nov, 29(6): 94-101. 2. Elster E, Upper Cervical Chiropractic Care for A 9 Year Old Male With Tourette Syndrome, Attention Deficit Disorder Hyperactive Disorder, Depression, Asthma, Insomnia, and Headaches: A Case Report, JVSR, July 12th, 2003. 4. Palmer BJ, The Subluxation Specific Adjustment Specific, Davenport IA, 1934. 5. Hondras MA, Linde K, Jones AP. Manual therapy for asthma. Cochrane Database Syst Rev 2000; (2): CD001002. 6. Balon J, Aker PD, Crowther ER. A comparison of active and simulated chiropractic manipulation as adjunctive treatment for childhood asthma. N Engl J Med 1998 Oct 8; 339(15): 1013-20. 7. Amalu W. Autism, asthma, irritable bowel syndrome, strabismus and illness susceptibility: a case study in chiropractic management. Today’s Chiropractic 1998 Sept; 27(5): 32-47. 8. Palmer, BJ. Chiropractic Clinical Controlled Research. Davenport, Iowa: Palmer School of Chiropractic, 1951. 9. Kessinger R, Changes In Pulmonary Function Associated With Upper Cervical Chiropractic Care, JVSR, Vol 1, No. 3, 1997.